RAISE UR PAW NEWS: A WISH FOR ARTURO --- RAISE UR PAW TODAY! A WISH FOR ARTURO --- RAISE UR PAW TODAY! "A wish for Arturo, a bear in despair, reaching out for help from people everywhere. This fragile life is in desperate need, so Raise Ur Paw United - a fight to succeed" ~ Ben Sterling. The heartbreaking life story of Arturo, the "Polar Bear in Despair", is one that has not only reached many individuals around the world, but has touched their hearts as well. Now fragile and slowly perishing, due to the extreme heat and conditions of the environment in which he resides (Mendoza Zoo), the hope for his freedom and sanctuary is fading just as quickly.. a sad reality that many animal angels around the globe are trying desperately to stop from occurring. But more of the World's Help and Support is Needed! 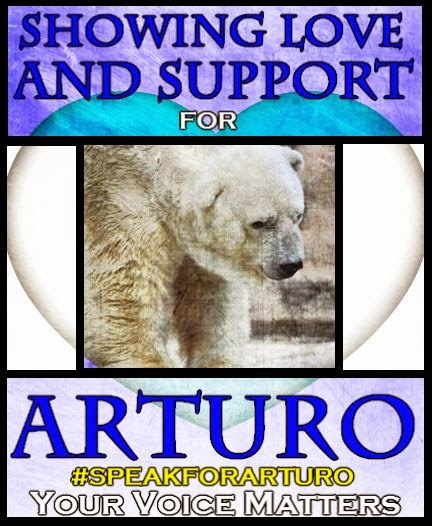 - for even if we do not succeed, at least we are raising awareness and opening eyes to the damaging conditions and environments that others, like Arturo, are living in and subjected to on a daily basis - an issue that is not only physically damaging to the innocent lives, but also psychologically. As I am sure that many are aware, Arturo is not just a polar bear, but a symbol of the cruelty and inhumanity of enslavement and exploitation - and how desperately it is needed for the Governments to flex and exercise their powers to help & save the innocent beings that endure this type of inhumanity regularly and prevent the damaging effects of confinement and taken from their natural habitats to environments that are unsuitable and inappropriate for these living beings. It is imperative that we use our voices to not only help those lives in need, but to also take the appropriate steps to make sure that such cruelty & inhumanity is prevented from occurring & that the lives in which are enduring this now is stopped once and for all. We need to better our World for all life - not just only for humanity. Please take part and Raise Ur Paw for Life in need - A change and difference needs to be made, if we want the hope for a compassionate and better World to succeed. THE CASE OF BELA --- A Companion Is Not Property! RAISE UR PAW TO HELP SAVE DUNAJ! Taiji Dolphin Slaughter - Boycott Japan Strategy? BABY ELEPHANTS KIDNAPPED FROM MOTHERS!